If it weren’t for you — and the generous dram-sized sample Robin forwarded me — I wouldn’t have given The Different Company Une Nuit Magnétique more than a cursory sniff. Usually when I test a fragrance, I start with a drop on the flesh at the base of my thumb. Then, if I like it, I give it real estate up my forearm. My test drop of Une Nuit Magnétique was sharp and tooth-achingly sweet. Not promising. If I hadn’t been considering a review, I would have quit there. It was only when I poured some into an atomizer and wet down my arm that I began to see Une Nuit Magnétique for what it really is: a tender, shimmering, intensely feminine perfume. Perfumer Christine Nagel developed Une Nuit Magnétique, and it has top notes of ginger, blueberry and bergamot; a heart of Egyptian jasmine, Damascus rose from Turkey, tuberose and prune; and base notes of amber wood, benzoin, patchouli, amber and musk. The Different Company classifies Une Nuit Magnétique as a floral amber. The first few seconds of Une Nuit Magnétique nearly scorch my nose with a string section of aldehydes, but right away the screech softens into warmth tinged with dry blueberry on a bed of woody amber. The fragrance pulls closer to the skin, and the unmistakable tingle of a generous helping of jasmine, brought down to earth just a touch by rose and perhaps still the blueberry, drives Une Nuit Magnétique’s heart. After an hour or so, woody amber takes over, the kind of sweet amber that shimmers like a tigers’-eye gemstone when you tilt it against the light. Reading Une Nuit Magnétique’s notes, you — like I — might be tempted to imagine a bolder fragrance with a greater range of presentation. Blueberry, ginger, jasmine, tuberose, patchouli, amber — all these notes paint a picture in my mind of a multi-layered fragrance with distinct fruit, earth, and dimension. Really, though, Une Nuit Magnétique plays on a tight bandwith of ambery notes, and those notes sit high, up there with piccolos and violins. But like the Queen of the Night’s famous aria in Mozart’s The Magic Flute, it’s mesmerizing. That is, if you’re into that sort of thing. Une Nuit Magnétique is relatively quiet, but present. It lasts about four hours before I’m tempted to boost it by applying more. Patchouli-phobes, don’t fear. The fragrance’s patchouli is subtle enough to be nearly impossible to pick out. 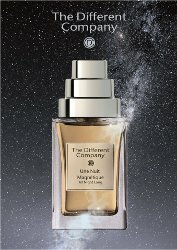 For me, I was glad to try Une Nuit Magnétique and remember that some fragrances need a full stage to show their beauty. But for the slender role the fragrance would play in my life, I’ll pass. I’m looking forward to smelling it on others, though. The Different Company Une Nuit Magnétique Eau de Parfum is $160 for 50 ml and $230 for 90 ml. For information on where to buy it, see The Different Company under Perfume Houses. As a huge fan of perfumer Christine Nagel, I would want to take a sniff of this fragrance because its her. But, from the description of the notes, I know this wouldn’t be anything that I would get excited about. I’m not a huge fan of amber. If you don’t love amber, chances are good this one won’t be on your to-buy list. But it’s still worth a sniff if you get the chance! Those top notes sound like a hot mess but, from your review Angela, it would seem that the ginger and bergamot are missing in action-or at least very subdued. Definitely subdued, especially the ginger. Oh, Angela, you point out here one of my great fears when trying new perfumes!!!! What if I’m unintentionally giving them short shrift, and I miss out on something lovely because I was impatient enough to just do a little dab (and then likely try half a dozen more of the next several minutes)?! That’s exactly how I feel! With so many contenders for sampling space, if something doesn’t strike me right away, it’s way too easy to say “next” and move on to the next one. Writing reviews has been so good for me in that it’s forced me to focus on fragrances that I might have otherwise passed by. It’s always disconcerting when application changes the nature of a perfume. It’s also frustrating, since so many samples come in those tiny dabber vials. I’ve often encountered the reverse, too: perfumes that smell appealing when dabbed, but overbearing when sprayed. This is another reason to try a decant before deciding to buy. I agree! Dabber vials are a mixed blessing. On the one hand, it’s great to have a sample. On the other, it’s so much better to be able to spray something, and spray two or three times, even, on skin. That way you really get a sense for the fragrance and how much you like it–or not. Decants are definitely my friend. I am always amazed at how differently perfumes can smell, feel and wear depending on whether they’re dabbed or sprayed. It amazes me, too, and Une Nuit Magnetique was a good reminder that a dab from a sample vial isn’t always the best way to experience a perfume’s full expression. This was my purchase on my first ever visit to the Scent Bar. It was almost 100 degrees and it was still my favorite. Something about it was just magnetic! I kept coming back to it. I am not an amber lover but I can’t wait to try this in cold weather. Ambers are wonderful in cold weather. And it sounds like you have good memories tied with this one, which makes it even better!